Looking for planting inspiration for your rain garden this spring? Check out our latest take on rain gardens by PPR Apartments! 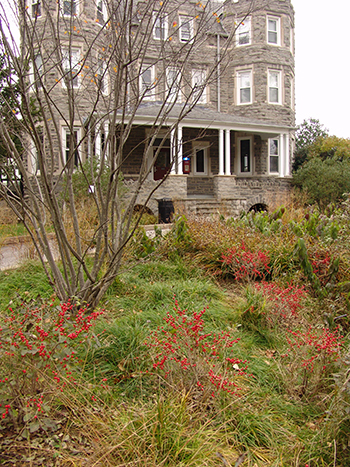 Rain gardens are traditionally small depressions, typically on a natural slope, containing perennials designed to temporarily hold and soak in rainwater runoff. As a result of the PPR Apartment construction, a rain garden was installed in the front circle drive of Palmer and Pittenger Hall to handle their rainwater runoff. 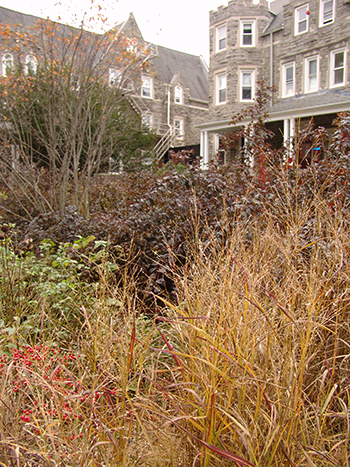 This rain garden was placed in a prominent location inspiring some different plant choices. 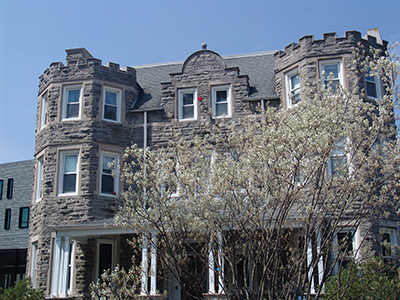 Unlike our other large rain garden, the BioStream, where water flows and infiltrates through the garden stream path, the Palmer Residence Hall rain garden retains and absorbs rain water in a large depression. To date, we have observed water standing for short periods of time. The rainwater is effectively being absorbed by the plantings and into the ground water. Communities are trying to mitigate rainwater runoff because water runs off impermeable surfaces, such as roofs or driveways, collecting pollutants such as particles of dirt, fertilizer, chemicals, oil, garbage, and bacteria along the way. Rain gardens collect rainwater runoff and filter the water with vegetation before the water percolates into the soil. There are many ways to plant a rain garden. 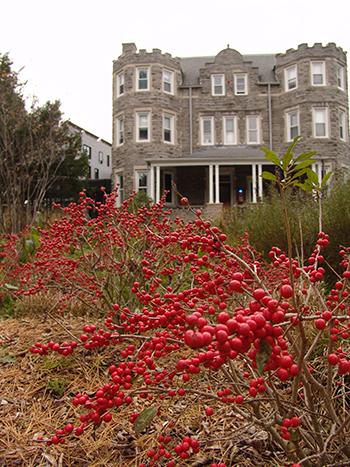 Landscape architect Bryan Hanes identified a unique group of plants to create a multi-seasonal, screening planting in front of Palmer Residence Hall. 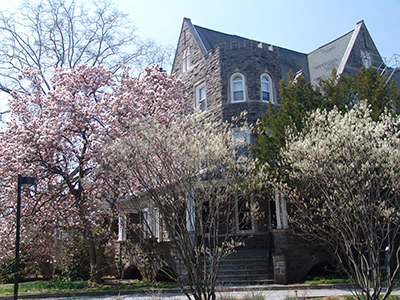 Planted along the end of the garden are several Amelanchier x grandiflora ‘Autumn Brilliance’, apple serviceberries, creating a screening effect from the residence hall and Chester Road. This wonderful native, multi-stemmed, understory tree can handle full sun to part shade. Producing showy white flowers in April and developing to blue drupe fruits that are favorites of our feathered friends. In addition to the benefit for our wildlife, Autumn Brilliance has brilliant red to orange-red color, completing a fabulous array of multi-season interest. Ilex verticillata ‘Jim Dandy’, winterberry; Ilex verticillata ‘Red Sprite’, winterberry; and Callicarpa americana , American beautyberry, have been added for winter interest. Our native Ilex verticillata ‘Red Sprite’ has wonderful reaching branches loaded with red berries courtesy of the pollination from Ilex verticillata ‘Jim Dandy’. From fall into winter the American beautyberry has delightful arching branches of purple berries. 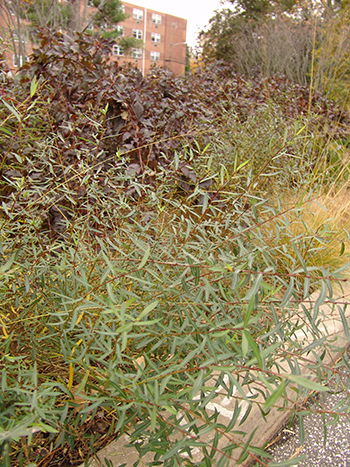 With its moist low ground, this garden has two purpleosier willows, Salix purpurea ‘Canyon Blue’ and Salix purpurea ‘Nana’. 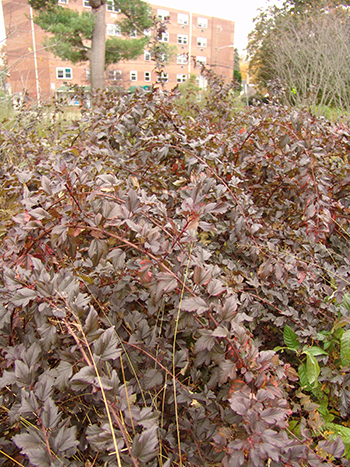 Both are dwarf cultivars; ‘Canyon Blue’ has steely blue-gray foliage and purple stems. Both willows produce interesting white-flowered catkins in the spring, while ‘Nana’ grows purplish young shoots that mature to grayish-brown foliage. A traditional rain garden shrub, the fragrant Cephalanthus occidentalis ‘SMCOSS’, Sugar Shack® buttonbush can be found in the planting. While not traditionally found in a rain garden, Physocarpus opulifolius ‘Seward’, Summer Wine™ ninebark adds color to the green palette of summer with its purple foliage. Arching branches of white flowers in the late spring and exfoliating bark in the winter, add great interest to the garden. 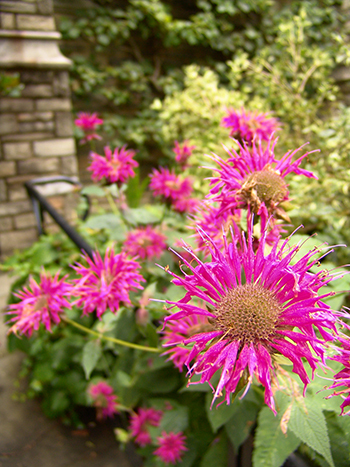 Also unique to rain gardens, two speices of bee balm can be found in this planting, Monarda bradburiana, eastern bee balm and Monarda didyma ‘Raspberry Wine.’ A member of the mint family and loved by pollinators, monarda offers summer long bloom. 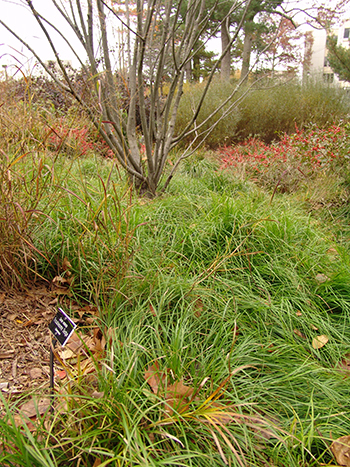 Tough disease resistant plants, Carex molesta, troublesome sedge, were added to the garden. Tough disease resistant plants, Carex molesta, troublesome sedge, and Carex pensylvania, Pennsylvania sedge were added to the garden. 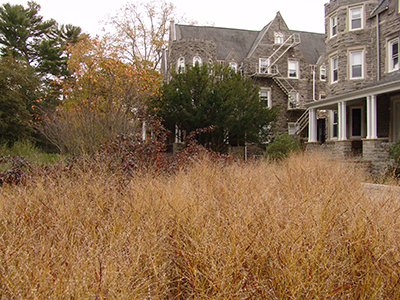 Troublesome sedge can be found toward the interior of the planting as it loves wetlands, while Pennsylvania sedge enjoys well-drained soil and can be found on the edge of the garden. 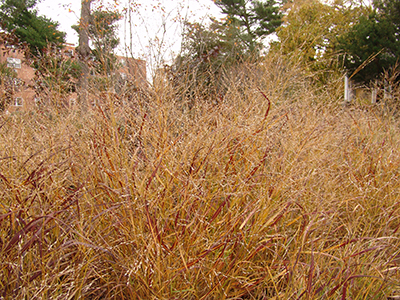 Finally, adding lovely texture to the garden in winter is Panicum virgatum ‘RR1’, Ruby Ribbons® switchgrass. Ruby Ribbons ® develops showy burgundy-red foliage which only intensifies through the fall. This North American native prairie grass develops red flower panicles often described as clouds blowing in the wind in mid-summer. These panicles persist into winter adding movement to the garden in the winter winds. Take a walk by Chester Road throughout the growing season to see our latest take on rain gardens evolve. I hope this plant list will inspire your next garden creation. Beautiful garden and very inspirational, some great ideas!! Thank you Wendy! Ihope you are enjoying your spring. Thank you Yvonne. I will be interesting to watch this planting mature.